There's a brand new Issue up over at Paper Issues called Showered with Love! One of this months themes is love, so for my layout I used a favorite photo of my Grandma that I loved dearly. 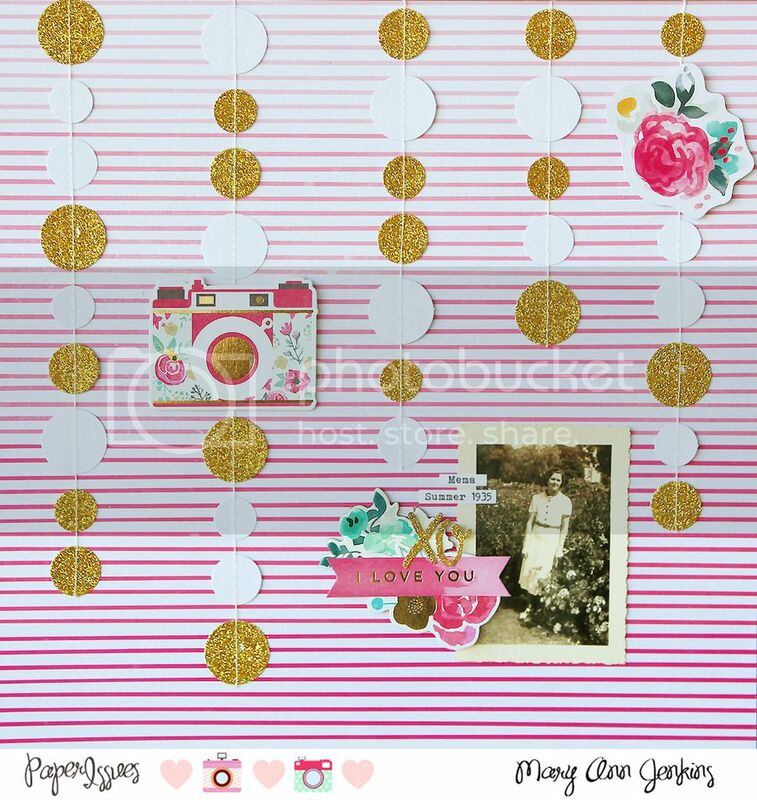 I used pieces from Crate Paper's Hello Love collection and We R Memory Keepers Crush collection, both are available in the PI store (use code: Mary Ann to save 20% your entire order!!) and then there's that amazing Artful Accents glitter garland from The Ribbon Resource by May Arts. Isn't it so pretty and sparkly! I cut the garland into different lengths, and then added them to the striped patterned paper. Next I added my photo, a few embellishments and journaling, then added the cute camera and flower cluster directly on top of the garland. I love how bright and colorful it is! Be sure to check out The Ribbon Resource, they have lots of beautiful ribbons, and that garland too!! A special thanks too to The Ribbon Resource for sponsoring this months Issue!! You should play along with this months Issue! Just post your projects in the Link and Win album by the March 6th deadline, for a chance to win a $25 gift certificate to the Ribbon Resource Store!!! Gorgeous. I love the banners.